The Air Force brass is pushing lush travel accommodations for themselves while troops put up with mangled seats on cargo aircraft, POGO and the Washington Post revealed this morning. A cache of internal Air Force documents and emails show that Air Force generals frivolously blew hundreds of thousands in taxpayer dollars because they didn't like the color of seat belts, carpet, leather and wood used in work and living space units being developed for use on cargo planes. The two little-known programs are called the Senior Leader In-transit Conference Capsule (SLICC) and the Senior Leader In-transit Pallet (SLIP). 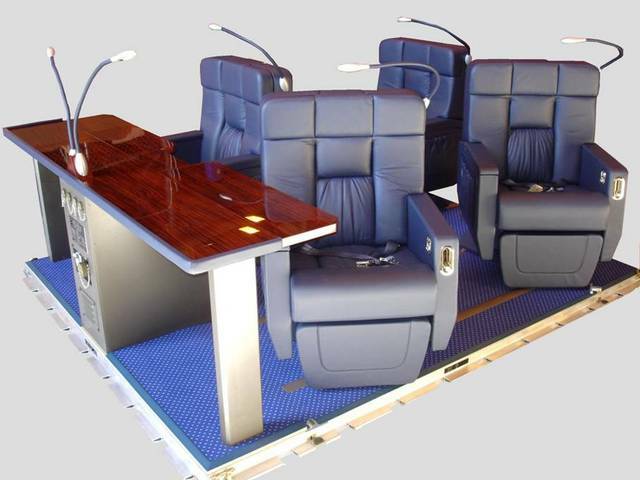 Earlier, SLICC was called Senior Leader In-transit Comfort Capsules, with the "Comfort" being dropped in favor of "Conference" at one point in late 2006 (pdf). 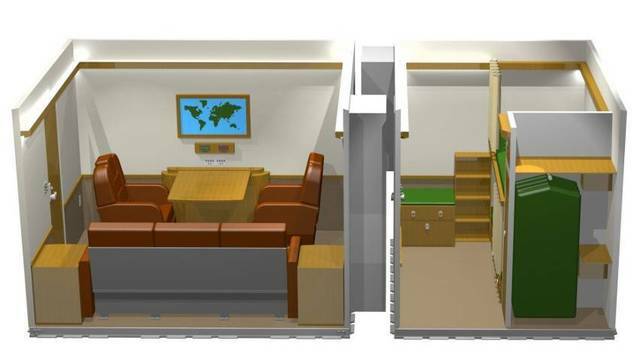 SLICCs are two connected chambers with first class amenities on a pallet that can be loaded onto a C-17, KC-10, C-130 and KC-X aircraft. These SLICCs are modeled on two existing “Steel Eagles” which are currently used for the most senior Pentagon officials (and are replacing the previous two “Silver Bullets” which are customized Airstream trailers). Each SLIP is made up of four leather business class chairs with tables that fit on a pallet that can be loaded on a cargo plane. The program began under General Duncan McNabb's tenure as commander of Air Mobility Command, a part of the Air Force that is responsible for air transport. General McNabb originally sought ten SLICCs and was involved in choosing the original color and material choices for the SLICC and SLIP leather, wood and carpet, which General Robert H. McMahon later changed at the tune of hundreds of thousands of dollars. Disgust towards the generals' requests grew inside the Air Force, leading the acquisition effort to be moved when one part of Air Mobility Command refused to make some of the costly changes. "In Mar 07, Gen McMahon requested A4 [Air Mobility Command’s Logistics Directorate] take over the acquisition effort when he could not get support from A5 [AMC’s Plans and Programs Directorate] for updates and cooperation on making the equipment ‘world class’ which was one of his goals,” according to an Air Force email. The “world class” emphasis entailed the costly aesthetic redesign of the interior of an already existing system known as Steel Eagle. After the first SLIP was procured, General McMahon expressed dissatisfaction with the color of the seat leather and type of wood used. He directed that the leather be reupholstered from brown to Air Force blue leather and to replace the wood originally used to cherry. As of March this year, the total cost increase for retrofit and further customization –which goes beyond wood and leather – for the SLIPs, directed by Air Mobility Command headquarters, is $493,000. The current dollar figure for the four SLIPs and one SLICC is approximately $4.4 million. The estimated cost of the first prototype SLICC is currently $2.735 million – and it is based on the already existing Steel Eagle design. Originally the SLICC was estimated to cost $1.743 million in November of 2006. There has been about 64% cost growth in less than two years. The four SLIPs are currently estimated to cost $1.66 million, up from the original cost estimate of $1.1 million in March of 2007 – a 66% increase. Cost increases in the program “have virtually all been in the area of materials and other non-labor costs due to the expense of SLICC/SLIP components and costs incurred by changing design details that were previously finalized” such as the leather and wood, according to an Air Force financial update. The money wasted here is a symbol of the disconnected and out-of-touch brass within the Air Force. Certainly there were some good guys here with a sense of perspective. As you can see above, General Kenneth Merchant had enough gumption to ask why these changes cost so much. But he was in the minority. Knowledge of the acquisition went even above General McNabb -- then-Chief of Staff T. Michael "Buzz" Moseley was briefed on the SLICC program. And as an email states, "the expectation was high" for the program. As readers of this blog well know, Moseley was canned by Defense Secretary Robert Gates about a month ago. I'd like our dignitaries to fly the same way our soldiers do. And people wonder how command gets out of touch. It is a lot less espensive than flying their own planes when they fly in a cargo plane with cargo already headed somewhere. Kill two birds with one stone. Wow. Is this the end result of the "culture of the fighter pilots"? Elitism, predatory careerism, neglect of our nuclear forces...Gen Schwartz, please save us. Hey Nick! Your story rocks. Have you seen the comments on the Washington Post's website about this? People are lighting it up. Let's hope their outrage doesn't pass with the weekend.